Easter is coming up fast, and the children will be out of school soon. So now is the perfect time to start organising some Easter activities. If a tradition at your home, school, nursery or playgroup is to have an Easter egg hunt then decorating an Easter bucket can be the perfect crafty pre-cursor to Easter chocolate. 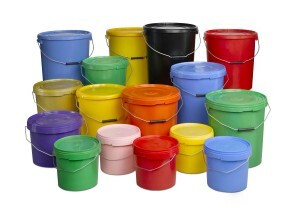 H&O Plastics manufacture plastic buckets in dozens of sizes, and you can buy them in bulk for larger groups of kids. 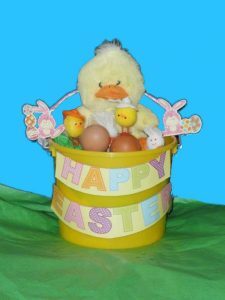 There are all sorts of ways that you can decorate plastic buckets with an Easter motif. 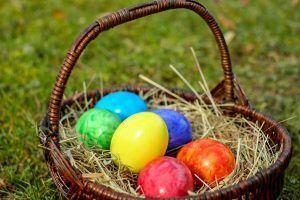 One of the most important things to bear in mind when decorating with an Easter theme is to keep a close eye on the materials that you are using. Some materials are more Easter-y than others. Because it coincides with the start of Spring, fresh natural materials go hand in hand with Easter. Symbolising fresh-born lambs, cotton wool balls make for excellent decorative flourishes. Flowers, petals, leaves and long stems can also work well and so can shells and sticks. Think about what children could collect from their nearby environment to decorate their buckets. Other materials like craft paper and fabric can also work well. Try cutting out paper flowers and sticking them onto the buckets (or just use stickers). You could also tie a length of ribbon around the neck of your buckets or, if you are going for a more rustic look, then try cutting an old hessian sack into strips for decoration. Pick a colour that will stand out – H&O Plastics stock a huge range of brightly coloured buckets, so whatever a child’s favourite colour is, you can find a coloured bucket to match on our site. Line your bucket with something special – The inside of your bucket is just as important as the outside. You have to make sure that you line it with something special. Colourful craft paper can make your buckets stand out, or for a more traditional touch you can try and find some hay to protect those precious Easter eggs. Print names on the buckets – If you are organising a big Easter egg hunt then you might want to print all the children’s names on their buckets. This should stop any quarrelling over buckets and it adds a personal touch that won’t go unnoticed. Painting on your plastic buckets is a good and attractive way to decorate your plastic buckets for a bumper Easter egg hunt. But the problem is that not all types of paint work on plastic. Some just won’t stick and some will streak making it difficult to apply. Oil and enamel paints are the best paints to use on plastic. These paints make strong bonds with the plastic and they aren’t washed off easily. Enamel paint comes in spray cans and is a good choice for large plastic surfaces that require a lot of paint in one colour. You can use stencils and paint cans on the buckets, and create a lot of different buckets. Easter eggs would make an easy crafting idea as would an Easter bunny. Be careful though, because stencilling usually requires the use of a sharp craft knife or blade. Adults should do this part. Spray paint an d other kinds of paint that work well on plastics can be harmful to children if not used correctly. Children should be well-supervised during these activities, or a responsible adult should take over for some of the most dangerous parts. Oil paints come in tubes and are good for small projects and projects requiring detail work and custom colour mixing. Make sure before you do any painting on your plastic buckets that you thoroughly clean all the surfaces to get rid of any grease or dirt. It might help if you put down a base layer of a neutral tone like white or beige and then put a more vibrant colour over the top of it.